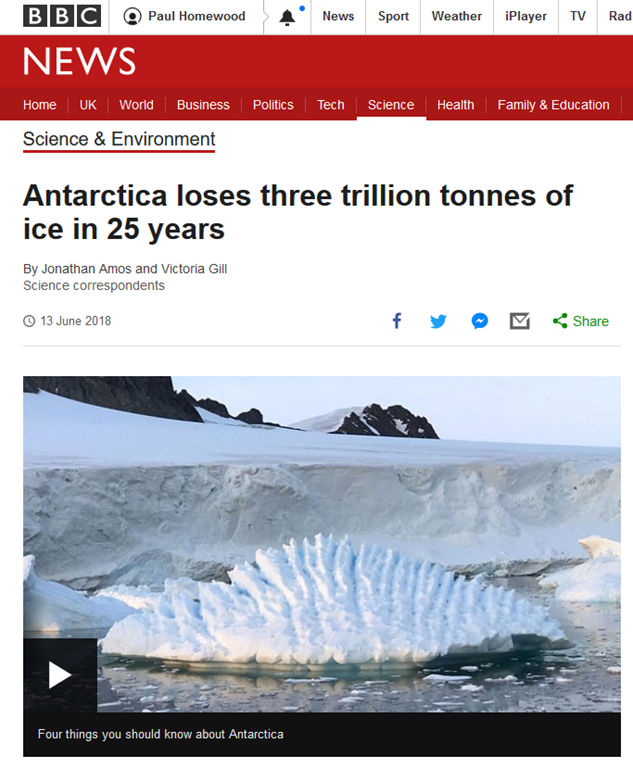 Despite the apocalyptic headline, ice loss has only been contributing about 0.3mm a year to sea level rise, about an inch per century. Given that sea levels have been rising at around 8 inches a century since the 19thC, there is no evidence that this is not a long-term phenomenon we are seeing...Indeed as Shephard himself is forced to admit, we did not start collecting data until 1992. This sort of melting could have been going on for centuries or longer. In fact, another paper published this month by Kingslake et al finds that there has been extensive retreat and re-advance of the West Antarctic Ice Sheet during the Holocene...Then there is the question of the accuracy of measurements. A major study by NASA in 2015 discovered that Antarctic ice mass has actually been increasing since 1992, basically because of greater snowfall, and not decreasing as this new study claims. In reality, measurements of ice mass are not exact and are subject to huge margins of error. Climate Depot Note: Here is another clue this new Antarctica study is screwy. It used models to simulate current ice status instead of actual data. In other the words, they had huge fudge factor. Excerpt: "The researchers pulled their data from sources including satellite observations and computer modeling." Imbie’s job has been to condense all this information into a single narrative that best describes what is happening on the White Continent. And the Imbie team stresses that the growth cannot counterbalance what is happening in the West and on the Peninsula. Indeed, it is probable that an unusually big dump of snow in the East just before the last assessment in 2012 made Antarctica as a whole look less negative than the reality. Globally, sea levels are rising by about 3mm a year. This figure is driven by several factors, including the expansion of the oceans as they warm. But what is clear from the latest Imbie assessment is that Antarctica is becoming a significant player. The latest edition of the journal Nature has a number of studies looking at the state of the continent and how it might change in a warming world. One of these papers, led by US and German scientists, examines the possible reaction of the bedrock as the great mass of ice above it thins. It should lift up – something scientists call isostatic readjustment. New evidence suggests where this process has occurred in the past, it can actually constrain ice losses – as the land rises, it snags on the floating fronts of marine-terminating glaciers. “It’s like applying the brakes on a bike,” said Dr Pippa Whitehouse from Durham University. “Friction on the bottom of the ice, which was floating but has now grounded again, slows everything and changes the whole dynamic upstream. We do think the rebound (in the future) will be fast, but not fast enough to stop the retreat we’ve kicked off with today’s warming. In Imbie’s last assessment, the contribution of Antarctica to global sea-levels was considered to be tracking at the lower end of the projections that computer simulations had made of the possible height of the oceans at the end of the century. The new assessment sees the contribution track the upper end of these projections. But anybody reading the BBC’s headline would be entitled to think we’re all going to drown soon!